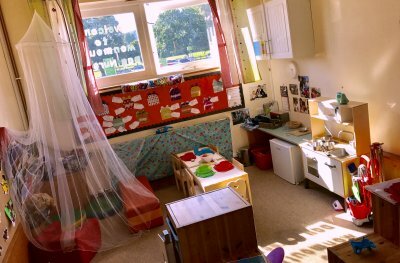 The Pre-school children aged from 3 years to 4 years have the use of 3 rooms along with garden play, walks, forest school and library sessions. 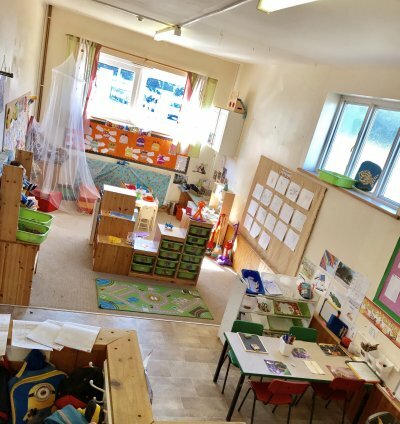 One room is used to teach basic numeracy and literacy skills through adult focus activities, as well as imaginative and construction play. This room is equipped with a tablet to develop the children's ICT skills; which is a key skill of the foundation phase. Another room is used as a messy play room; each child has the opportunity to explore sand, water, dough, paint, glue etc. The Foundation Phase is introduced to all pre-school children. Children are encouraged to explore sound, colour, texture, shape, form and space in both two and three dimensions. They respond in a variety of ways to what they see, hear, smell, touch and feel. Through art, music, dance, stories and imaginative play they show an increasing ability to use their imagination to listen and observe. Within this area children are encouraged to develop knowledge and understanding of their environment, people and the work they perform, different cultures, animals and other living things. It also covers energy, how things work and the appropriate use of technology in support of the learning experience. We now offer weekly forest school sessions every Thursday for our pre-school children. These sessions are run by a trained forest school leader. During the forest school the children explore their natural environment with a hands on approach to learning. This area focuses on how children respond and cooperate with each other outside the family environment. Emphasis is placed on the importance of personal, social, moral and spiritual development, for example personal values and understanding of self and others. The foundation phase focus’ on language development and the ability to communicate with others. It emphasises speaking, listening, reading and writing abilities. This area focuses on building a clear understanding of number concepts which include, shape, colour, number value and recognition, measuring, problem solving and investigation. There is an emphasis placed on the use of mathematical language. The focus in this area is on the child developing control over their own body, having an awareness of space and being competent with manipulative skills. The aim is for the children to learn the basics within the welsh language. Our aim is to provide a good foundation of knowledge in preparation for entry to primary school. We also do weekly visits to the library for Welsh singing and story time and weekly cooking activities with our welsh speaking cook.